Today’s Neville Goddard lesson is focused on health and healing. …that includes doctors and lab results. Instead respect and use the power of your imagination. There are 3 levels Neville shares that we are going to explore. Those are, Stone (facts), Water (Mentally Understanding the methods), and Wine (spiritually doing). Believing in the power of the lab result is “stone”, the facts of the world. Those are the lowest level, and when you use the methods (convert water into wine) the stones change. Let’s dive deeper! “God is, for I am! I kill and I make alive, I wound and I heal. Remember “I am” has the power to kill and make alive. It isn’t too much salt or germs that make you sick or ill. It is the power of the mind, your wonderful human imagination. If it was salt or germs, then why isn’t everyone sick or ill? Not everyone responds to germs or salt the same way – because of the power of the imagination. Use your power to heal by choosing your power to heal. You aren’t your body. Neville says, you are “the word”, what dwells within your body. You are the animating spark, you are consciousness. POWERPOINT: Notice in the recording below how we can REMOVE PAIN AND SUFFERING AND ILLNESS from God just as easily as we can plant the seeds for suffering, sickness and illness. Notice where Neville says FREEDOM IS FOUND! You are not your body…. Thinking you are your tiny little powerless body – makes your life – powerless and tiny. On the other hand, when you get that you are massive and powerful, you are consciousness, the animating spark, how you experience and how you heal from sickness and injury changes big time. Not only is it faster, but also you remain at peace. To DIVE deeper – GET THE RECORDING – notes from my little notebook – TWO BONUS LECTURES that we just LOVE and ADORE and the many more life changing insights and easy steps you can start using today get the recordings below. Get this amazing recording set right now by clicking below. This is such a timely article 19 days ago I fractured my left tibia and sprained my right ankle. I had some well meaning friends and even some doctors who went about the way of the world and said it would take 4-6 weeks to heal. I thought there is a reason why the consciousness on this planet is developing at treacle speed. 20 Comments on "Neville Goddard – Health and Healing – Sickness and Suffering"
I hurt my back this week, and decided to share what I know works, what matters, what makes a difference. Enjoy and feel free to leave a comment. My desire for you is to get better. I already sent you a healing vibe. Be safe! Thank you for your sharing…that’s your caring! Much love to both you and Victoria. I just manifested this within minutes at about 7:08 this morning. I work in an area where there is just a few of us that can do what we do. There are literally 3 during the week and 2 on the weekend. Our hospital depends on us to complete our tests, rain or shine. I agreed to cover a shift for a co-worker, not knowing that I and my whole family would get really sick…fevers, coughing, runny noses. This morning came, and I still felt terrible. I had to take action to change the situation. I began to imagine that there were just 4 patients that needed tests completed and that they could handle it by themselves. I would receive a text message, telling me to stay home if I wanted. This would mean that they would have an easy Friday(which is rare) and I would have time to care for my family and myself. Moments later, my phone chimed and here I am at home. Amazing! You are Precious Mr. TT! Would this include clinical depression? It is a rough road, and am told it may be temporary or life long. Hate the drugs. There are a great many spiritual teachers who have similar belief that I personally have, that there is nothing wrong with psych meds in themselves, or in treatment for what people would call a mental disorder. Sometimes, the meds “hold the space” so that the person taking them has the stability to choose and enter into the healing state. Treatment and healing are two very different things. I had to treat my thumb the other day. I wacked off a bit of it while cooking. (The meal was delicious). But I primarily focused on HEALING – having it as healed. (Anytime I injure something, the first thing I do is enter into a VERY altered state, that involves healing focus – it having healed – etc. So back to your question…. “I am depressed” probably isn’t the best statement to make. “I have clinical depression”, just notice what that creates. It could create ownership, and since we live in a pack rat society – some things like that can be easy to hold onto. Like all those extra socks and old underwear. “I have been experiencing a state – a thing – that the doctors called clinical depression.” – Notice how that starts to create some wiggle room, which is great. “I remember when….. I had this thing…. Every now and then stuff might seem to bring me down a bit – but since I am greater than any state….” Explore stuff like that. Experiment with those, remember – it’s your mind. Other thoughts, explore food sensitivities and food allergies. I’m serious about this. I had a friend, a follower of Neville, who discovered that her body was sensitive and allergetic to some very specific foods. She invested about $250 and learned EXACTLY what foods to eliminate, and her body lost about 100 lbs and her mind – well it changed her life BIG TIME. NOTE: For the extremists out there. In the recordings I share how FOOD does not cure hunger. Hunger is a state of mind, as well as being associated with a physical need for food. But unless we generate fullness and satisfaction inside the mind, we will often eat way too much food. In a similar way, temporarily taking a psych med or having to take one for an extended time – could be a biological need – due to injury etc. So we deal with that, while holding in mind the healing – the wish fulfilled. Taking a food sensitivity test / allergen test does not violate Neville in any way, just like eating a meal doesn’t – even though we can imagine being full (something more people could really benefit from). Hope that makes sense. Note: I am not a medical doctor etc. No diagnosis or treatment is offered here. Just some loving sharing of experience, with a focus on health and personal healing. Thank you kindly for the taking time out to address the issue I presented (notice – not “MY issue). I was indeed hanging on to it. I see some things I can do for myself immediately. Alot of good information.I will print it out to remind myself. A thumb story, if you don’t mind. I cut my thumb to the bone. It healed, but hurt like heck and had no feeling in the top part of the thumb. One day I just kept wishing all day that I could have a healing. Suddenly, I jumped up and decided to put new distributor wires on my Healy. I had not said, “In perfect ways” for my healing, unfortunately. I grabbed a wire while the engine was running (not so clever) and got a shock all the way to my teeth. The thumb has never bothered me again (30 years ago). Thank you again. All your work is greatly appreciated. I had a fall last week and badly grazed my leg, I know my body will heal as quickly as I allow it to. So I decided to reverse the Neville process and find out why I had done this to myself. (All an inside job). After a couple of days of mulling this over it came to me That I had been regurgitating to family and friends something that had happened to a family member a few months back I was opening up this open sore time and time again. Here I now have an open sore on my leg. What a reminder to change the way I think, change the way I talk and have my mind in a different state. What a lesson. Thanks Twenty Twenty and Victoria for you easy to understand interpretations. The imagination is powerful, isn’t it. We find that being aware of it’s power is life changing, and freeing – and it carries a huge opportunity, that is to sahre the power that comes by changing how we think, and the states we come from. Within minutes, I almost cut a finger off with a saw. So there we were, both of us sitting in the garden, remembering the power of the human imagination – with a powerful lesson to share – focus precisely on what you choose to have in your life. “No injuries” involves focusing on injuries. So that invites injuries to manifest. “Healthy hands and bodies” invites healthy hands and bodies. To the beginner, they might sound the same. But once you know how it all works, you know that there is a huge difference. May you be blessed our dear friend, thank you for sharing a powerful and simple reminder, so we can do the same. Nevillize, reverse the states and use a technique called the violet flame. In addition to that go to a very good naturopath, who would put you on some good nutrition. Move the body, dance walk, lay on some grass and breathe with the pulse of the Universe….the combo of all of this will shift your energy positively. (1) How do I “assume health” (sic) ? For example, I want to have total over-all good health – spiritual, mental, physical and sexual good health ? How do I “assume” that ? (2) For how long do I have to maintain the visualizations per day ? 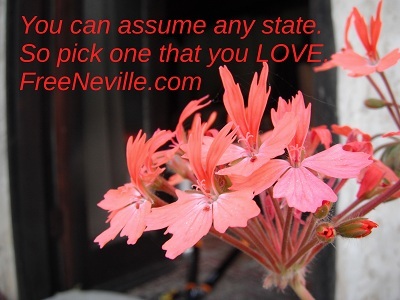 (3) Can I abstractly “assume health”, instead of using my imagination ? (4) What happens if I have a whole list of other things to manifest ? (5) Since I have problems practicing upon waking up, before sleeping and at work, can I do so at any time ? If so, are there principles to observe ? (6) What were Neville’s teachings on (a) death, (b) post-death and (c) dying ? How about more severe illnesses such as HIV or full blown out Aids? Can people cure themselves of such diseases also. I have had great success avoiding catching colds,or minor discomfort. But,the ringing ear syndrome, Belz palsy side effects – dysfunctional facial gestures, and HIV are still to be removed. Any suggestions for midlife crisis depression issues? I’d just apply the tools in the Neville Goddard toolbox, and read a few articles a day. Mr. Twenty Twenty & Victooria, this reading was awesome! I just mentioned to a friend that I was about to unsubscribe from you because it seemed it was all about manifesting money and I don’t believe for one minute, this was what Neville was all about. He taught being one with God and now my Faith has been restored that you are teaching his true message. I have suffered severe emotional pain and this has been so enlightening to me and made me realize that you do understand Neville and will reach so many more through his true teachings. Bravo to you for this artical. I will now continue to read you. We just checked and it looks like you don’t have this one yet. Just Great. It is a matter of…can we accept that power unto ourselves, can we? I know for me I accept everyday….and everyday…and everyday. And if/when I suddenly feel…adrift I stop. feel it real UNTIL I FEEL IT REAL…. whatever that may be (usually, joy and power) and then… I am arighted.